If you are planning any great long distance motorcycle trips, the idea of motorcycle trailers has probably crossed your mind. Imagine loading your motorcycle onto a trailer, hitching it to the back of your truck or car, and then 4-wheeling to your starting destination. Clearly, owning a trailer has benefits. First, you can avoid boring stretches of highways, an especially appealing thought if you are planning a west coast trip and you live in the Midwest. Secondly, you can escape with your motorcycle from snow and ice for more appealing locations - and do so in comfort. Without a motorcycle trailer, there is no way that we could attend Daytona Bike Week. With out luck, we'd be traveling back north in the middle of a blizzard. Very importantly, you can avoid having to ship your motorcycle to a distant location, and you can skip the plane trip. It may take a bit more time to get to the starting point, but you'll have an adventure on the way. While you may opt to buy a trailer new, there are many great deals out there on used trailers, and since you are not dealing with an engine's wear-and-tear, buying second-hand is certainly worth considering. If you do buy a used trailer, make sure it has a motorcycle ramp. A very necessary accessory, that you won't miss until you need one. Travel Tip - If you are planning to venture a distance from your trailer, don't forget to make arrangements for leaving the trailer at your starting point. Most hotels or motels will allow you to park a trailer for a nominal fee, if you plan ahead. Enclosed Trailers - The most expensive, and most secure option, enclosed trailers come in a variety of sizes - from one bike to multiple. You can opt for an aluminum or fiberglass shell. 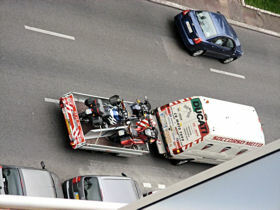 Inside an enclosed trailer, the motorcycle is usually secured with tie-downs to the floor and walls of the trailer. An added benefit - more packing room for gear and other stuff that you might accumulate on the trip. Open Flat Bed Trailers - Without the aluminum or fiberglass shell, a more affordable option for hauling your bike. Folding Trailers - Usually made of lightweight steel, these are the barest of open bed trailers, and have the ability to fold up for easy garage storage. Rail Trailers - Even more lightweight than folding trailers, your motorcycle is ridden up a ramp onto a rail, and then secured. Another affordable option, these come in one, two or three bike versions.